The mom who started it all, meet Nicole Irving! Folds, Walker & Maltby, LLC is a full-service civil law firm serving the legal needs of individuals, families, businesses and local governments. We are proud of our new name, but we have the same goal of fostering a firm culture based on traditional professional values. The Partners share the common vision of growing the practice where integrity, hard work, personalized service and excellence define success for our clients and the firm. Dr. Raju is passionate about providing positive dental experiences to children so they have a great foundation to build a healthy and beautiful smile. She is a graduate of the University of Florida College of Dentistry and completed her residency in Pediatric Dentistry at the University of Florida, Naples. She specializes in the treatment needs of infants, children, adolescents and special needs patients. She is a resident of Gainesville, a voracious reader and loves the outdoors. Dr. Raju and her team are attentive to your children’s clinical and emotional needs. They provide age appropriate explanations to minimize your child’s concerns and to allay their fears. Dr. Raju’s approach is conservative, focusing on prevention and education in order to lead to a lifetime of self-motivated care. Call or visit our website today to make an appointment. Irving Publications, LLC reserves the right to edit and/or reject any advertising. Irving Publications, LLC is not responsible for the validity of any claims made by its advertisers. Nothing that appears in Giggle Magazine may be reproduced in any way, without written permission. Opinions expressed by Giggle Magazine writers are their own and do not necessarily reflect the publisher’s opinion. Giggle Magazine will consider all never before published outside editorial submissions. 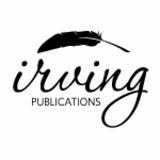 Irving Publications, LLC reserves the right to edit and/or reject all outside editorial submissions and makes no guarantees regarding publication dates. For more information on advertising with Giggle Magazine, please visit Irvingpublications.com or call 352-505-5821. Creating happy, healthy smiles, one child at a time. Providing specialized dentistry for children and adolescents in a â&#x20AC;&#x153;child-friendlyâ&#x20AC;? environment, we focus on preventive care to help each child have a healthy smile that will last a lifetime. 352-335-7777 Dr. Robert N. Mixon, D.M.D., P.A. Dr. Rachel C. Witcher, D.M.D. Education Matters! We are proud to be Board Certified Pediatric Dentists. Nicole's photo by Jimmy Ho Photography | Cake provided by Sugar, Refined. And, today, I am still Mom, first and foremost. But, I am also #Bosslady, Editor-in-Chief, Publisher and Momprenuer. All roles that help me be the best mom I can be. Owning my own business, this business, has taught me so much about my family, my strengths, weaknesses and this amazing community. 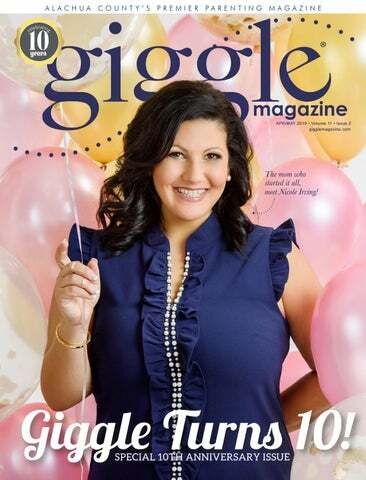 The pages of Giggle Magazine have been my parenting manual, where I have learned more about parenting kiddos than I ever thought was out there from our amazing writers and contributors, and also where I have shared my stories of struggles and triumphs in hopes of inspiring others. And, while my goal is still to get to print with both eyes open, it is also to continue to inspire, grow and learn each day as #Bosslady of Giggle Magazine. cheers to 10 years! Through the last 10 years, on more than one occasion, I have been introduced as “Miss Giggle.” A title I proudly accept. It is true, Giggle Magazine was my idea. An idea that came from the mind of a sleep deprived young mom of three boys less than 4 years of age who knew nothing about publishing, photo shoots or AP style. A mom who did not have the goals of winning publishing awards, design awards or Business of the Year from the Chamber (10 years ago I would have said, what is the Chamber?) or even a thought that I would be here today, 10 years later. Nope, I was just a mom who had this crazy idea of starting a business as a “hobby” and my goal was to make it to print with both eyes open! Power Power Up Up Your Your Child Child This This Summer Summer Mathnasium can transform your child’s summer with a balance of constructive learning and fun. We’ll Mathnasium can transform your child’s summer with a balance of constructive learning and fun. We’ll help you choose one of our Summer Power Workout Programs, which include fractions, multiplication, help you choose one of our Summer Power Workout Programs, which include fractions, multiplication, algebra readiness, geometry readiness, and more. We help kids avoid the academic “summer slide” and algebra readiness, geometry readiness, and more. We help kids avoid the academic “summer slide” and give them an edge for the next school year… and beyond. give them an edge for the next school year… and beyond. For 15 years, we’ve been the authority in math education, growing to over 900 centers worldwide. Teaching For 15 years, we’ve been the authority in math education, growing to over 900 centers worldwide. Teaching math is not just what we do, it’s all we do. math is not just what we do, it’s all we do. Start your child’s transformation. Schedule a comprehensive free assessment today. Start your child’s transformation. Schedule a comprehensive free assessment today. 36 GET HEALTHY Sweet Enough! 38 GET PRETTY To Pierce or Not to Pierce? Get Your Home Ready for Earth Day! Baby Fever! The Spectrum Summer Camp Guide 2019 Cheers to 10 Years! Roundup and Get Ready for Kindergarten! Favorite food? Anything that I don't have to cook. Favorite thing to do with your family? Travel What did you want to be when you grew up? An archaeologist Craziest mom moment: Waddling out of Target at 7 months pregnant with two screaming kids under my arms...true story. You see her on TV. That perfect TV mother who has her kids groomed, eating pancakes and out the door exactly on time every day. But, we know the truth… mornings can be rough. Dragging kids out of bed, trying to get hair brushed and fighting to pick out an outfit, all before sending them to school with a granola bar for breakfast is closer to our reality, right? But, in all this chaos, when do we have time to get ourselves ready for the day? Introducing Mom Hacks, on how to get ready just a little bit faster and easier. DRY SHAMPOO: Who doesn’t live by this? If you’re going on the third or fourth day of unwashed hair, dry shampoo is your new best friend. It gets rid of the greasy look of hair and gives a bit of volume in the process. HAVE A TO-GO MAKEUP BAG: If you’re the kind of girl who likes to wear a little bit of makeup, having a small to-go bag of your favorite products in your purse or car at all times will be a life saver. UTILIZE THE “REMINDERS” APP: In the morning haze, it’s hard to remember to do little tasks. As soon as it comes to mind, make a reminder in your phone that will pop up in the morning to jog your memory. SYNCHRONIZE YOUR COFFEE MAKER: Adjust the settings on your coffee maker to wake up before you do. This way you can wake up to the smell of freshly brewed coffee and have your caffeinated reward for getting out of bed! SHOWER THE NIGHT BEFORE: Showering at night is a game changer, moms! Not only does it cut down on how long it takes to get ready in the morning, it’s also a time for yourself once the kids go to bed that you can relax and regroup for the next day. MAKE A “GETTING READY” PLAYLIST: If you’re trying to keep yourself on-track and on-time, try making a playlist that ends up at the right amount of time you need to get ready. But, don’t hit shuffle! Learn the song order and soon you’ll recognize when you need to pick up the pace and when you’re right on time. Weddings, Commercial and Corporate, Headshots, Portraits, Performance Makeup & more! Contact Kara today to book your session! Based in Gainesville. Travels the world. Leave your concerns to the most experienced CoolSculpting facility in Gainesville. Mention this ad and receive 20% off CoolSculpting. Send us a friend (new to Pure Aesthetics) and you both receive $40 credit toward your visit! What is the craziest sleep deprived thing you have ever done? Local mom, Jessica Weingart, shares her story! As a mom, you quite literally do it all! Between working and making sure your kiddo gets to school with a matching pair of shoes, it proves to be the toughest job anyone could do. Our Giggle moms have shared with us what makes them a #BossMom, and we are all for it! Today, her schedule is a little different, balancing her two children, work and life. Are you a #BossMom or do you know one? Do you work hard at home and at work? Giggle Magazine wants to hear your story! Visit Gigglemagazine.com to submit your #BossMom for a chance to be featured in one of our upcoming issues. “Currently, my kiddos are 12 months and 8 years old. My oldest is in a new magnet program in Archer and my youngest is watched by a friend, close to Westwood middle school where I teach 6th grade math this year. Because of his allergy to anything cow (beef, dairy, cheese, anything yummy) I continue to nurse/ pump and have eliminated all of his allergens from my diet to ensure he gets the best milk I can provide without paying $47/carton for formula or him having responses to the allergen. In addition to teaching at Westwood and Pofahls, I teach Pilates at GHF and online through the Early Childhood Center at UF,” she said. Kimmy Keck is really a mom who does it all. While pregnant with her second child at 40, she finished her master’s degree in educational leadership with straight As, while working full-time as a teacher in a high needs school, and was the on-site trainer for the Thinking Maps Language for Learning program. She also continued working part-time as an adjunct professor at UF and a dance instructor/ choreographer for Pofahls Dance Studio. What is Important To You... Is Important To Us! The Most Outstanding Cleaning Experience... OR IT’S FREE! We love celebrating the arrival of little bundle of joys at Giggle! Here is a look into some of our favorite baby shower features we have done over the last 10 years! Baby Announcements! PHOTOS COURTESY OF THE FLESNER, BAKER, HANSEN AND HERNANDEZ FAMILIES. Announcing that you have a baby on the way is a pretty big and exciting deal. There are a number of different ways that you can share the great news. Social media plays a big part in these announcements as well, with people taking photos specifically to announce to their friends on the internet. Take a look at how some of our readers told their loved ones that they were expecting! After we told our family that we were expecting our first born, we did the big reveal on social media. We used our pets to announce that they were getting a little sister in March! For Christmas, I sent my parents a baby photo album with a note ‘Coming in July.’ But Christmas was two weeks before I found out there were going to be three babies! We recently snuck into my mother’s house on Valentine’s Day and surprised both her and her husband with a scavenger hunt throughout their house. There were about eight hints/clues in total and it was all part of one big rhyme that I came up with. It started in their dining room and ended in their oven with the announcement of our second baby. When I was pregnant with my third (fourth counting the previous miscarriage), we told our older daughters that they would get an early Christmas present. We wrapped up two boxes with pieces of paper. My oldest daughter, 9 years old at the time, had paper that said she was going to be a big sister again. My other daughter, 7 years old, had paper that said she was going to be a big sister. They were super excited! There are so many different products out there for you to choose from. We’ve helped you narrow that list with our favorite products to help you complete your baby’s nursery. Happy shopping! This air purifier uses a certified HEPA+ filter and removes 99.7 percent of allergens and pollutants. The Termo is a 4-in-1 digital thermometer that measures temperature without contact. This electric battery-operated nail trimmer is great for shortening your baby’s nails without a worry about injury. This is the one-stop solution for your babyproofing needs! This night light is energy efficient and essential for not disturbing your sleeping child, it can last up to 20,000 hours. These adorable diapers are perfect for your baby, they are made from eco-friendly materials and complete with advanced leak protection and a super soft liner! Check out our babyproofing article on page 84! Do you have a kiddo who absolutely refuses to eat their veggies? Have you tried everything in the book to make them tolerate the taste? Well, don’t fret! Try our three banana smoothies with a hidden veggie that your kids are sure to love! They’re easy, fruity and delicious! DIRECTIONS FOR ALL SMOOTHIES: 1. Slice the banana 2. Place ingredients into blender 3. Blend until thick and creamy or desired consistency 4. Pour it and serve it! Steam the cauliflower before you use it to get a smoother texture in your smoothie! Bring some fun into your kitchen with these quirky food gadgets! From a retro slushy machine to your very own ice cream maker, your summer days can be filled with endless fun, laughter and amazing memories. Check out some of our favorite items below! u 1. Nostalgia Retro Series Slush Drink Maker $44.75 Amazon.com Make mocktails for a hot pool day or pair up a slushee with your popcorn for movie night! 2. Chef ‘n Sweet Spot Ice Cream Maker $49.95 Williams-Sonoma.com With this fun and innovative ice cream maker, you can bring an ice cream parlor right in to your own home. x Photos courtesy of manufacturers. 3. Hamilton Beach Classic Drink Master $39.99 Walmart.com If slushies or ice cream aren’t your thing, then maybe you’d love to make an at-home milkshake! Treat your kiddos to a milkshake after dinner on a summer night! 4. BPA-Free Silicone Popsicle Molds $10.95 Foodworksbrand.com These six multi-colored pops are great for juice, yogurt, fruit and so much more! Add your ingredients and freeze to make a frozen pop! y 5. Nostalgia Retro Pop-Up Hot Dog Toaster $19.99 Walmart, Amazon.com Bring the joy of street-side hot dogs right into your home. This hot dog toaster makes two hot dogs at a time and is perfect for some family fun! 6. Taco Truck Set $13 Genuinefred.com Celebrate Cinco de Mayo or Taco Tuesdays with these fun and festive taco trucks! They hold 2 tacos upright so that you can fill it with your favorite toppings. 7. Microwave Popcorn Popper $15.00, uncommongoods.com Perfect for an at home movie night, this cute and quirky turn on traditional microwave popcorn is a must-have. GAINESVILLE’S APP FOR EATING OUT GCM gives you reusable gift certificates to the restaurants you love. Win back your weekends and leave the work to us. Imagine a lush, green lawn for your family to play on. Bright, cheery plants welcoming you home each day. More time to spend doing what you love, without the hassle of lawn worries and weeds. You and your family deserve the very best and that’s what we’re here to provide. Experience vintage Florida living nestled in the northwestern sector of thriving Gainesville, Florida. Legacy at Fort Clarke Apartments is an enclave unto itself, which is convenient to lakes, creeks, springs, and rolling greenery. Here you can appreciate the atmosphere of academia and take advantage of the finest medical facilities, while also enjoying the wilderness and outdoor recreation. your exposure to BPA Use BPA-free products. Look for products labeled as BPA-free. Cut back on cans. The lining of most cans contain BPA resin, so reduce your use of canned goods whenever possible. Research (NCTR) have shown no effects of BPA from low-dose exposure.” However, researchers continue to say that BPA is something you should be strongly aware of and should limit your exposure to. Once the news of BPA being in food containers, especially those of babies, hit the newsstands and people’s inboxes, more information became known about links between products containing BPA and cell dysfunction, asthma, infertility, heart disease, brain dysfunction and even more. This was the point where many people went into official panic mode. Plastic bottles were tossed aside and glass containers took their place; sippy cups were thrown away and replaced with stainless steel ones. Avoid heat. The National Institute of Environmental Health Sciences, part of the National Institutes of Health, recommends not microwaving any plastic container or putting them in the dishwasher, because the plastic may break down over time and allow BPA to leak into foods. Use alternatives. Instead of plastic containers, use glass, porcelain or stainless steel containers for hot foods and liquids. Formula. Purchase powdered infant formula and not liquid ones in bottles as the BPA may leak into the liquid. So are BPA-free products really safer for us? Well, research is always evolving, and the jury is still out on the overall long-term effects of continued exposure to BPA, and whether those effects are untreatable. Many experts claim it is harmful, while others disagree. Still, companies have offered alternatives in the form of BPA-free products. These products have been developed to keep us and our families safer. With you at every step! Constipation is a common health condition, and children are not immune. According to the BMJ journal, it is one of the top 10 common problems that pediatricians see in their office, and up to 8 percent of American children are chronically constipated. Typically, stool softeners are the laxative of choice for pediatricians to prescribe for children with constipation, Kirkconnell said. According to the North American Society for Pediatric Gastroenterology, Hepatology and Nutrition (NASPHGAN), stool softeners are not habit-forming and may be taken for a long time without worrisome side effects. Common signs of constipation are gas and bloating, less frequent bowel movements, and stool that is dry, hard and painful to pass. There are many causes of constipation, and some may be psychological, physical or both. Changes in dietary routines or life occurrences (start of school, vacations, move) can cause constipation in children. A diet low in fiber or inadequate hydration may also be causes. Sometimes, especially around the time of potty training, children may also be “holding it in,” because of a fear of using the bathroom or resistance to use the potty. Children should have a diet with plenty of fresh fruits and vegetables, high-fiber cereals, whole grain breads and a variety of beans and other legumes, like chickpeas and lentils. Parents should also be sure that children are getting plenty of water and limit sugary drinks. Kirkconnell also advises reducing dairy products. can help a child’s system to get moving. A study in the journal, Gastroenterology, found that children with constipation may benefit from exercise, because it can help strengthen pelvic floor muscles which can help with bowel movements. fight “potty time,” make sure they are going and sitting on the toilet for at least 5 minutes within 30 minutes of a meal. Having a calendar of potty visits to help keep track of bowel movements helps. Having a step stool by the toilet helps for a child to put their feet on. “The goal is to have consistent, soft and comfortable bowel movements so as soon as a parent feels as if their child is chronically in discomfort or pain, they should consult with their health care provider immediately,” Kirkconnell said. Parents should consult their pediatrician when their child begins to feel uncomfortable with their gastrointestinal symptoms, said Stephanie Kirkconnell, pediatrician at Alliance Pediatrics. If a child is chronically constipated, pediatricians may turn to laxatives as a solution. There are different types of laxatives, which include stool softeners, like Miralax, or stimulants like ExLax or Dulcolax. Fiber supplements like Metamucil can also help to encourage bowel movements. Laxatives or supplements are generally not recommended for children under the age of 2.
probiotic and fiber supplements. Probiotics can help to improve digestion, immunity and brain health. In kids, probiotics can improve chronic constipation symptoms and can reduce abdominal pain. * Always consult with your pediatrician prior to administering any medicine or remedies for constipation. LET THESE EXPERTS TAKE CARE OF you! Insurance got you screaming? Let a low-cost monthly membership to Celebrate Primary Care ease your stress and receive unlimited access to a health care provider, 90% off retail prices for generic medications and 90% off lab testing with most test being able to be done in-house every month. No contracts or commitments. Your child’s health and wellness begins in the comfort of your own home. You strive to make sure that your child has the best pediatrician and access to healthcare, but what about the families in the third world countries who physically cannot access the same types of medical assistance we have here? Thanks to the World Health Organization (WHO), we can rest easy knowing that strides are being made to give everyone access to a better life. On April 7th, we celebrate World Health Day, a day in which we celebrate the anniversary of WHO, and honor the difference it has made in the years since it’s very first project. The WHO works all over the world to allow families to live healthier lives by combating disease, administering vaccines, working to provide clean drinking water and so much more, something that some of these families could only dream of. According to the WHO, their Constitution went into effect on Apr. 7, 1948, and now, the organization that’s almost 71 years old has over 7,000 people working in their 150 country offices, six regional offices and at their headquarters in Geneva, Switzerland. The WHO has departments that oversee different departments for accessible health and has a specific vision for each one of them. The organization has a lot of accomplishments. According to WHO, “6 million fewer children died before they reached their fifth birthday than in 1990, smallpox has been defeated and polio is on the verge of eradication.” These health milestones let families enjoy longer lives together. Also, many countries have removed threats like measles, malaria, tropical diseases and mother-to-child transmission of HIV and syphilis. The WHO makes these changes in people’s lives by implementing simple treatments and action plans to get things done. mental health and well-being,” according to WHO. It’s an easy trap to fall into. Candy as treats when potty training, going out for ice cream as a reward for good grades, hot chocolate after school on cold days. Sugary foods are quick and easy to utilize when we want to feel good or give a special prize, plus they taste good and kids love them! And adults are no better, not only at wanting sweet treats, but at giving them to children. Before we know it our children are taking in more sugar than they should. The saying goes “everything in moderation,” but what is moderate when it comes to sugar intake in our children? How can we monitor it properly and ensure that they aren’t consistently getting more than they should? A 2016 statement released by the American Heart Association (AHA) says children ages 2-18 should eat less than 25 grams of added sugars daily. Yes, there is a difference between added sugars and those that are naturally occurring in foods. The AHA defines the naturally occurring sugars that are found in foods such as fruit (fructose) and milk (lactose). Added sugars are sugars and syrups put in foods during preparation or processing, or added at the table. It’s the added sugars that are linked to health problems such as Type 2 diabetes, high blood pressure and obesity; none of which we want our children to suffer from. In the new recommendations from the AHA, designed to keep kids healthy, experts recommend that children consume less than 6 teaspoons of added sugars per day. That is about 100 calories from sugar. However, according to the American Academy of Pediatrics, children in the US are consuming an average of 19 teaspoons of added sugar daily. If you are doing the math, that is an extra 13 teaspoons a day. (For labeling purposes 4 grams of sugar equals approximately 1 teaspoon.) Most of that extra added sugar is coming from sources such as: sports drinks, soda, fruit juices, candy and cookies. Did you know one can of Coke contains 42 grams of sugar? Children and teens should limit their intake of sugar-sweetened drinks to no more than 8 ounces weekly and the recommendations advise that children under the age of 2 years should not consume foods or beverages with added sugars, including sugar-sweetened drinks. That follows the AAP recommendations that your child only drink milk or water. A total elimination of sugars can be hard to manage but keeping tabs on how much doesn’t have to be hard. When looking at labels, be sure to make note of any ingredient such as syrup and ending in ‘ose. Also, don’t be fooled; organic sugar is still sugar. Heather Procknal, a mom and board-certified integrative health coach to kids and teens, created her own business on the health and wellness of children. She teaches simple strategies in nutrition and lifestyle that add up to big changes and happier healthier kids. Her advice is the first step in keeping sugar at bay, is to become a “Sugar Detective,” by reading labels to find “hidden sugars.” Knowing that these substances are also identified and metalized like sugar by the body, will help in reducing the amount that not only your child, but you take in on a regular basis. Procknal suggests one way to keep sugar levels in check is by using stevia as an easy sugar swap. PROS: It’s naturally derived from the stevia plant and is available in powdered or liquid form. It won’t raise blood glucose levels like regular sugar. So, there’s no sugar crash or mood swings afterward. CONS: It can have a slight aftertaste and can increase sugar cravings if overused. So, moderation is the key to making this sugar swap. PRO TIP: Try gradually swapping regular sugar with stevia into your baking and cooking, to make the transition from granulated sugar less noticeable. The chances of your little one noticing will be much better. All in all moderation IS the key. It probably won’t hurt to eat sugar some time; the key is not to make it a habit that your child craves! Our foster families are helping to build a strong community. You can too! To learn about becoming a foster parent, contact Nicole Hernandez at 352-213-7219 or Nicole.Hernandez@pfsf.org. Meet our Giggle cutie, Penelope! your daughter’s ears pierced reinforces the idea that they must adhere to society’s set gender roles. While to some, it might only seem cosmetically pleasing, there is a lot that goes into the decision process. Culturally speaking, it could be something that’s a part of your heritage and piercing your daughter’s ears could be a way to respect your roots. According to the American Academy of Pediatrics, ears can be pierced at any age, as long as it’s performed carefully and cared for conscientiously. If so, there is little risk of it getting infected. However, they do recommend to postpone the piercing until the child is mature enough to take care of the pierced site herself. For those who want to pierce their daughter’s ears, they recommend getting it done by a professional doctor, nurse or experienced technician, as doing the procedure at home could increase the risk of infection. The involvement of infants is what makes this a heavily debated topic. There’s a lot of arguments over whether there are any health risks associated with piercing a baby’s ears so young. Claire Woodward, who is a mother to three daughters who are now in their early 20s, said she chose not to pierce her daughter’s ears because of the fear that the babies would pull out their earrings, but also because she felt that it was a commitment they should make themselves. “I felt like it was something they should decide if they wanted to do it,” said Woodward. While piercing her daughter’s ears weren’t for her, Woodward did mention that she understands the act has a different significance for everyone. “Culturally, my family never pierced our baby’s ears, it was just not something that people typically did,” she said. Every parent has a unique way they care for their child and that includes customs and traditions often taught by their own parents. For some mothers, piercing their child’s ears may be incredibly important to them, as it proudly symbolizes a part of their background; other moms may disagree because of their own culture or what they believe in. In the end, it’s up to the decision of the parents, who know what is best for their child; no decision is a wrong one when it comes to piercing your child’s ears!
! There are pros & cons to piercing your infant's ears. When making the decision to pierce your child’s ears, speak with your pediatrician. Photo courtesy of the Hernandez family. From the food that we feed our babies to the many ways we chose to hold them, there doesn’t seem to be a single topic that isn’t targeted to debate. Each mother has her own opinions on how to properly care and raise her baby. One issue that will always be timely is whether or not you should pierce your child’s ears when they’re an infant. Knowledge, highly concentrated Children absorb so much information, so early, so fast, it seems like a miracle. Kiddie Academy ® helps you make the most of every moment your child has to observe, interact and grow. From motor skills to social skills, we recognize it's never too early to nurture every learning opportunity. $60, Motherhood.com This full-body pillow will support your head, back, neck, hips and belly to let you get a relaxing night of restful sleep. Take a soak with these therapeutic bath flakes and feel your problems wash away. The nourishing ingredients in this lotion work to prevent stretch marks and alleviate the unanticipated itchiness of your growing baby bump. From that glowing skin to amazing thick hair, being pregnant definetly has it's perks. But we know that some days can get really tough. Growing another human is hard work! These products will help you stay rested and feel beautiful while your body changes, and we just canâ&#x20AC;&#x2122;t get enough of them! One spray of this aromatherapy mist and youâ&#x20AC;&#x2122;re smelling ginger and citrus to soothe your upset stomach and your mind. This tea blends together all the home-remedy ingredients used to relieve morning sickness like ginger, chamomile, lemon, orange and mint. This magnesium mist can help with your energy levels, cure your nausea and soothe your aches and pains. Now Registering for Fall 2019! For many of us, autism is not just a term. You might know of someone who has it. Whether you have a child on the spectrum, you have it, or you’ve become familiar with it through a novel you read or a show you watched. There is a lot we think we know about the disorder, but what we don’t know is that the information about the spectrum is endless. It’s hard to understand everything about the disorder, even when you’re on the diagnosed side. Imagine being told you have a diagnosis with no real cause or cure available. A diagnosis is very complex and doesn't look the same for any one person. The autism spectrum is wide and varied and many people in our community are affected by the disorder, but that will never take away how much we love them and celebrate them for who they are. Autism awareness day is April 2nd, and whether or not you know someone who is diagnosed, it’s an important day all around. *If you think your child has any of these symptoms, consult your pediatrician to schedule an appointment to receive the proper diagnosis. One of the biggest resources and the first call Ella’s family recommends anyone given a diagnosis of ASD to make is to UF CARD (UF Center for Autism and Related Disabilities). There they were enrolled in a training course called “Project Social Communication” for parents of children recently diagnosed. “This training, lasting several months, set the tone for how we would continue to fight for Ella’s progress.” Today, Katharine says Ella is thriving, but it was a very different story just a year ago. It has been a full time job to manage her educational, physical and emotional needs. Katharine says she definitely feels that she was fortunate to have the flexibility to attend these meetings during working hours. She says she sees a lot of moms who have to work full time and cannot manage these processes as easily. She has become a mentor mom to several other families that have children with autism. Today, Ella communicates fairly well. She scored close to her chronological age on her most recent speech evaluation, she is able to independently regulate her sensory needs most of the day, and has met many of her most recent ABA goals. Although she struggles with understanding everything and sometimes has a hard time expressing herself, she is a happy, fun, and smart kid who loves her family and her friends. It is important to remember that in between the struggles and frustrations; on the good days and the hard ones; these are children and also adults who have autism not who are autistic. “I think this is a sentiment shared by a lot of autism mamas, as it is something that she has, not something that defines her.” Katharine said. For the rest of us, be kind. Understand that when you are around a child with autism they may not behave or react to situations the way you are used to. Know that they and whomever their caregiver is, is struggling and don’t be judgmental. Encourage and be patient. You don’t know what major milestones are in the making. Here is a typical day for Ella today as compared to one just a few years ago. Katharine believes Ella is where she is today because of the early interventions she received. KIDS WITH AUTISM CAN STRUGGLE TO MAKE SENSE OF THE WORLD. The aViation study at Sarkis Clinical Trials is testing an investigational drug that may improve the social communication and interaction skills of 5-to-17 year olds with ‘high-functioning’* autism. AN OVERVIEW The aViation study (BP30153—Balovaptan) A phase II placebo-controlled study that will investigate the efficacy and safety of Balovaptan in children and adolescents. * For this study, that means an IQ of at least 70.
financial habits from their parents and other important people in their lives. children appropriate ways of handling money, the likelihood of them falling into poor habits is very high. The good news is, we have many resources at our disposal today to not only help ourselves form good financial habits, but also to help our kids do the same! WHAT IS FINANCIAL IQ? A person’s financial IQ is defined as their ability to obtain and manage their wealth by understanding how money works. The six areas used to determine someone’s financial IQ are spending, credit and debt, career and income, investing, financial planning, and risk and protection. HOW CAN I HELP BOOST MY CHILD’S FINANCIAL IQ? For better or worse, your kids have a high likelihood of following in your financial footsteps. If you want your child to have a healthy financial IQ , it is incredibly important that you lead by example. Explain to them what is happening when you use your debit card at the grocery store. Talk to them about what you are doing as you pay bills. Help them to understand that we can’t spend money that we don’t have. You can begin teaching your children about financial topics when they are very young. For example, my 3-year-old is currently learning about spending, saving, and giving at a basic, by dividing up her allowance into a piggy bank with three sections. My 7-year-old is starting to help us with the household budget. It’s never too early to start teaching them. You can also begin to implement money saving strategies so that your kiddo can understand that money doesn’t grow on trees. When they get excited about money they received over the holidays or for their birthday, try teaching them to save some of the money and write out a goal of what they will spend their money on. If you don’t feel confident in teaching your kids about money because you feel like you don’t handle money well, start by educating yourself. Two of my personal favorite books for teaching yourself about money are “Total Money Makeover” by Dave Ramsey and “Get a Financial Life” by Beth Kobliner. By raising your own financial IQ , you will set your child up for success as they learn from your example! There are also a number of online materials you can access, as your child gets older. The Foundation for Economic Education or (FEE) is an educational foundation devoted to helping boost financial IQ in young adults. FEE has many free online courses as well as in-person seminars and free books for the classroom that can help your teen become more aware about money and its importance. Also, check in with your local bank or credit union. Many have programs directed at children and family finances. Bringing them in with you while you do some simple banking transactions is a great learning tool. Teaching your child about money doesn’t have to be a daunting task. The key is starting them young and continuing to teach and show them throughout the years. Soon enough they’ll be great money savers! IN STYLE Largest selection of birkenstocks in North central florida! What better way to welcome the warm sun with this fun, cute and easy watermelon doormat? Follow our how-to guide to bring a little color right onto your front porch! SUPPLIES 1. All purpose sponge 2. Plain doormat (we bought ours for $9.99 at Target) 3. Green, black, pink acrylic paint 4. 3 paper plates 5. Paint brush 6. Scissors DIRECTIONS 1. Use scissors to cut your sponge in a triangle with a rounded edge on the bottom and a “C” shape (one that matches the length of the rounded edge.) 2. Separate three plates. On the first two plates, put green and black paint. Use the third plate to add the pink color. 3. Using the triangle-shaped sponge, dip one side in the pink paint and place it on the doormat, pressing down firmly. 4. Take the “C” shaped sponge and dip it in the green paint. Place it above the rounded side of the triangle to create a watermelon slice. 6. Using a paintbrush and the black paint, paint black seeds on your watermelon slices! 7. Let dry completely before placing on your porch! 5. Repeat until you have created your desired pattern. Let dry and apply a second coat of paint. Got Kids? Got Pets? Got Spills? Call today and mention Giggle for a 15% discount! Ink stains are tough, but the solution is quite simple. Most can be removed with alcohol, specifically ethanol. You can find ethanol in non-aerosol hairspray, hand sanitizer or rubbing alcohol. Apply the alcohol of choice liberally and let the material soak for 10 minutes, then throw the item in the wash on a normal cycle. This trick will work even for set-in ink stains, and is safe to use on color fabrics! Grease and oil stains, including crayon and lipstick, can be problematic if they are rubbed in or left to set. However, WD-40 is great for removing oil and grease from fabrics of all kinds. You simply spray the area, let it soak, then wash as usual. If you don’t own WD-40, an alternative for oily fabric stains is baby powder. The powder soaks up the oil and the stain will rise to the surface, making it easier to remove. Using WD-40 or baby powder to soak or lift the stain is an important first step before you start scrubbing away at greasy fabric stains. WD-40 is also great for wiping off crayon, dirt and fingerprint marks on walls. Before you throw away your kid’s white shirts because of those yellow, underarm sweat stains, try this removal trick. Crush two aspirins and dissolve the powder in a 1/2 cup of warm water. Soak the stain for two to three hours, (the longer the better), then rinse to find your go-to white-tee looking good as new. If you don’t have aspirin, a mixture of lemon juice, salt and water will often lift the stain. For this remedy, however, be sure to wash the garment quickly after application! Red wine stains can be lifted to the fabric’s surface and easily washed out with the application of salt and club soda. First blot the stain to dry excess fluid, then cover the spot with salt. Wait a few minutes and rinse with club soda, and then again with water. This method is effective because it makes it easy to act fast and not let the stain set. Another great thing about this trick is that it's available both at home and at most restaurants. There’s no need to let a small spill ruin your night! MATTRESS STAINS Even though our mattresses are covered by layers of sheets, sometimes as parents we know deep down that our child’s mattress has a stain or two from a potty accident. Here’s how you can get those dreaded yellow spots out of the mattress that you spent a lot of money on! Fill an empty spray bottle with hydrogen peroxide and baking soda, finish with a simple drop of liquid dishwashing soap. Spray the yellow stained area and let it soak for five to ten minutes. Blot the wet area with a towel to raise the stain. If the stain is not completely out, repeat the process! Spot test a small section before cleaning the mattress! There are some mattresses in which this remedy may not be the best. happy home | clean it safer, nontoxic ingredients like vinegar, lemon juice, baking soda or borax. A quick Google search can bring you to all kinds of cleaning recipes for every room in your house. Storing your homemade cleaners in glass spray bottles and containers will also cut down on your plastic use and let your cleaners last longer. or store leftovers is a great fix. Also, those Keurig cups can pile up and they can get expensive! Buy a reusable Keurig cup that you can refill with your favorite coffee. These items do require a little more dishwashing than your normal load, but washing dishes can be a quick after-dinner chore for your kids before they watch their favorite shows. Spending the money on these reusable products will save you so much money in the long run, because you aren’t wasting your money on products you throwaway every week. Enjoy the money you’ll save, while you save the planet! This is another way to go green and save money on groceries, at the same time. Exercise your green thumb by having a small seasonal garden for veggies and herbs that you can add to your dinner. Growing a garden promotes great sustainability, and you can make your own compost to nourish your garden, by using food scraps like carrot tops and eggshells. Let your kids help you plant and tend to the garden so that they too can learn to become sustainable –and maybe this will make them want to eat their veggies! Another great way to help the environment is as easy as throwing trash away in the garbage can. Recycle! Simply sort out what you’re about to throw away and toss the recyclables in your bin and the rest goes in the trash, or if you own one, a compost bin. Gainesville’s rule on recycling is, “When in doubt --- don’t throw it out.” The City of Gainesville recommends checking the A-Z Recycling Source guide on cityofgainesville.org to see what you can recycle in your own home! The list also has suggestions for what you can do with stuff you no longer want in your home, including places where you can donate goods! We like to keep a clean house, so why not keep a clean Earth, too? These small changes in your household can have a big impact on the planet, and you can rest easy knowing that you and your household are working toward a cleaner Earth. WE HAVE SEVERAL DISCOUNTS AVAILABLE. GIVE US A CALL TO FIND OUT MORE! MAKE YOUR HOME CLEANER, CALL TODAY! Your family will thank you. NewboRN Home Visiting is a free program available to Alachua County women. After your baby is born, a registered nurse (RN) or licensed midwife will visit you at home to see how you and baby are doing, share information and connect you to resources. Now booking in home Pop-Up Parties! Participating agencies: Healthy Start of North Central Florida, Florida School of Traditional Midwifery, UF Health, UF Health Shands HomeCare, North Florida Regional Medical Center, NurseCore, New Beginnings. Funded by: The Alachua County Board of County Commissioners as recommended by the Childrenâ&#x20AC;&#x2122;s Services Advisory Board. For the dad looking for the perfect gift, to the mom looking to #treatyoself, we've got you covered! IS YOUR CHILD STRUGGLING WITH READING AND WRITING? Summer’s Coming… Avoid Summer Slide Reserve your spot for our Summer Program! REGISTER NOW for FLORIDA MUSEUM FIELD and SUMMER CAMPS! Dive into the sciences this summer through hands-on exploration. JUNE 10-AUG. 2 Camps are designed for students enrolled in grades 1-4 for the 2019-2020 school year. Nature Photography is for grades 5-6. Lep Camp is for grades 5-8. Pre-registration is required. For more information, call 352-273-2061 or visit www.floridamuseum.ufl.edu/summer-camps to register. Invite, Disciple, Send, and Share the love of Jesus. YEAR ROUND SWIM LESSONS AT BOTH LOCATIONS! CoolSculpting is an FDA-cleared CoolSculpting is an FDA-cleared treatment that uses controlled cooling treatment that uses controlled cooling to eliminate fat without surgery or downtime. to eliminate fat without surgery or downtime. And with 95% customer satisfaction, And with 95% customer satisfaction, you’ll love the results of CoolSculpting you’ll love the results of CoolSculpting every time you look in the mirror. every time you look in the mirror. MAKE-UP BY KARA WINSLOW | PHOTOS BY JIMMY HO PHOTOGRAPHY | CAKE BY SUGAR, REFINED. We can’t believe that it has been 10 amazing years since we published our very first Giggle Magazine. What started out as just a little project in the nursery of our founder's 3rd son, has grown into an award winning family and parenting magazine that has had the pleasure of showcasing our community families, children, heartwarming stories and businesses. We can’t wait to see what the next ten years will bring! Thank you for welcoming us into your homes and families! Special thanks to Danielle Gamble from Sunshine and Sprinkles (Facebook.com/sunshinesprinklesgville) for creating this adorable rag tie banner for us! Don’t forget the games! An egg relay race ties well into a farm theme and is fun to boot! Whether you decide to have your kiddo’s birthday celebration at a farm or bring a petting zoo to you, animals are an integral part to a perfect farm party. Always make sure to have hand wipes and hand sanitizer at the ready when handling animals! Simply give the kiddos wooden spoons and eggs (you can hard boil them for easier cleanup) and see who can make it to the finish line the fastest without dropping their egg. You can also create your own ring toss with old fashioned soda bottles and mason jar bands! You can easily make this barn centerpiece yourself! We used a red tri-fold project board, white tape and black construction paper. Make your own trail mix (check out our recipes on page 34!) for a delicious, kid-friendly snack. Fill your “pig pen” with servings of pigs in a blanket. Be sure to provide an even mix of sweet and healthy snacks! One of my favorite birthday party spreads! Who wouldn’t love to have barnyard animals at their party? My husband, who is a red head, inspired this issue. We never dreamt that we would have over 100 submissions of local redheads. We couldn’t narrow them down, so we included as many as we could and after three days of photoshoots, we were left with this most amazing spread and cover ever! Inside: the 2nd annual Kids Room Makeover Reveal! The yellow school bus, apple and cover cutie just scream back to school excitement! Alachua County's Must-See Fall Festivities! The Dyal quintuplets were the most fun to photograph. 5 little balls of energy, personality and smiles! The issue that started it all. This issue will always have a special place in my heart. Here are a few of my favorite Giggle pages from the last ten years. Enjoy! life | our special story My son has Type 1 Diabetes. "Did I cause this? Is this my fault? ns, Daycatio e's valentin D treats anaK sprinG bre camps! Through my tears, our pediatrician explained I did not cause this. She was able to help me understand that his pancreas just stopped producing the insulin his body needed. And, unfortunately, there was no answer as to why. Through the last five months, I have realized just how very lucky my son was that we caught it when and how we did. He did not go to the ER. He did not go unconscious. He was lucky. We were lucky. Beaches, theme parks, nature and more! October 1 marks five months since our world changed. After 13 years, 11 months and 3 days, my son’s pancreas decided to call it quits. Today, he is the one in the 1 of 400 who live with an incurable disease: Type 1 Diabetes. This little cutie holding the most perfect orange makes me smile every time I see it! after we got home from the trip for a check up. It was there that I attempted to causally, and in the most non-panicked tone I could muster, mention what was going on the days prior and asked if she could check his sugars. We had time before our endocrinologist appointment and I looked at my son and explained what was happening and what this was. It was NOT a death sentence, it was a new way of living. Fighting back my own tears, I saw tears well in his eyes as reality set in and gave him the space he needed to process what was happening before we headed to our endocrinologist appointment. plan the perfect Galentine's Day! After a marathon, five-hour endocrinologist appointment and diabetic counselor meeting, we returned home with a new set of rules, needles, injections, drugs, measuring tools, alcohol wipes, monitors and binder that held our new life together. To say that we were overwhelmed that first night would be an understatement. Fast forward to today. We are five months into life with this incurable auto-immune disease and we are still standing. There have been good days and bad days. There have been sleepless nights when his new CGM (continuous glucose monitor) continues to sound an alarm when his sugars go to high and worried days when his sugars go to low during cross country practice. But, there are so many days that I look at him with pride for all that he is going through. Through it all, my kiddo has taken this like a champ. He has never asked "why me" or cried another tear after that car ride. From day one he has administered his own insulin, taken his own glucose and counted his own carbs. The resilience of my child inspires me; I am in awe of his strength and ability to cope and share what is going on with his body. Our wonderful nurse came in, checked, and gave me a look no mom wants to get and numbers no mom wants to hear, "His sugars are 321." My heart sank because I knew what that meant. 10 years of writing, editing and researching topics and stories to help parents raise their kids and recognize signs of distress and illness made me immediately realize what was happening and how our whole world was about to change. How his whole world was about to change. The continuous rest-stop breaks, the non-stop drinking and unquenchable thirst, I knew what it meant but hoped for something else. As those numbers came out of her mouth, my heart broke into a million pieces as my son stared at my pale face. However, I have taken it harder, as any mother would. I cannot fix this. I want to take this from him. I want to know why and how. I want his life to be normal again and go back to the day before his pancreas quit and BEG for it to keep going a bit longer! But, I can't. Insulin and glucose monitors. Counting carbs and alcohol wipes. This is our new reality. What have I learned in the last five months? I have learned that at any point, anything can and will change. I have learned to never ignore my mom-gut. I have learned to always and unapologetically advocate for my children. Tyler's Dexcon G6™ Continuous Glueclose Monitor I have also learned that Type 1 Diabetes is not the same as Type 2 Diabetes and no amount of hope and tears will jump-start his pancreas. His life will always require sugar monitoring, insulin injections and carb counting, as it cannot be cured with just diet and exercise. I have learned that this is our new normal. As we continue to venture into this new and crazy territory of living with diabetes, I have to count the blessings that have happened: I have been embraced by the most wonderful support system, I have been open and honest with those around him so they know how to help him, and I have seen so much love strangers, friends and family that has warmed my heart in ways I will never be able to repay. I am raising a child who can self-advocate I have seen him grow and mature so quickly that I am humbled by his strength. I realize that every day is a gift and that we shouldn't sweat the small stuff. *Portions of this story were originally published on Nicole’s personal blog and has been expanded on and updated for this issue. Follow her at NicoleBIrving.com for more of her and her son’s journey of living with Type1 Diabetes, or send her an email to share your diabetes story at nicole@irvingpublications.com. In May of 2018, my oldest son was diagnosed with Type 1 Diabetes. I wanted to share our journey, of hope and love, to help others who may be going through the same diagnosis. MEET OUR HOTTIE DAD WINNERS! ICE CREAM…IT IS WORTH SCREAMING FOR! It’s no secret that I love twins! So, our “Seeing Double” was a dream come true when we had the opportunity to photograph 11 sets of twins! This was one of the rare times we went “on location” out of Gainesville. We met at Crescent beach, played in the sand and surf and had a blast! anniversary | where are they now? Gabriela is in 5th grade. She loves to craft, slime and do yoga in her spare time. Her perfect day would include playing with puppies and sitting outside in a hammock reading her favorite books "Keeper of the Lost Cities." While still under the close care of several specialty physicians at UF Health, Nate is doing great and is excited to start middle school in a few months. Emma is now a freshman in the Cambridge Program at Gainesville High School. Colton just turned six! He loves kindergarten and his new puppy. He enjoys playing basketball, baseball and swimming! A LUNCH TIME gets a new twist! MUST HAVES TO ACE THIS SCHOOL YEAR IN STYLE! Isabella is loving 1st grade and wants to be an art teacher when she grows up! Nick,Tyler & Josh The Irving Boys are growing up fast and are enjoying life and playing sports! Anabel Anabel is 7 years old, and a first-grader who loves reading and horses! London London is 8 years old now. She is in elementary school and loves all animals, Pokémon, and soccer! These Giggle cuties have graced the covers of some of our favorite past issues. We caught up with them to see how they've grown and what's new in their lives. Sayers Grooms remains very busy with her WatchMeRun nonprofit work and continues to chase her passion for sharing the joy of RaceRunning with other mobility-challenged individuals. She also has been training regularly with her coach and dreams of Paralympic competition someday. The McGriff family is staying busy living the dream and staying afloat. Typical busy kids, busy jobs and taking time to smell the roses. 7 must-have sweaters for fall! The Youmans family continues to have a positive outlook on life since their article, they have experienced many triumphs together as a family. Joshua is in the 5th grade and loves to play soccer and lacrosse and was on the JV basketball team this year. Olivia is a freshman at Oak Hall School where she runs track and plays soccer and volleyball. She plans to finish Oak Hall and head to California for college. Nico plays varsity lacrosse at Fletcher High School as an attack and still loves surfing. Kaylee, age 15, is a freshman at Oak Hall School, where she is a member of the varsity swimming and diving, soccer, and track & field teams. Monte is a freshman at Oak Hall School. He is class of 2022! IS ICE CREAM…IT WORTH SCREAMING FOR! Yulian is an outgoing, fearless and caring 11-year-old... he is willing to try anything! Camil is 21 months old now and can count to 10 in Spanish! Her favorite thing by far is dancing! Your Kids Will Love You For! We Know What Mom Wants for Mother's Day! Cole is a 19-year-old student at UF, he loves music and plays club volleyball through the university! Campbell is loving 3rd grade and all things CHEER! FAMIL Family Hallo Y ween Costu mes! Trixie just turned four and is obsessed with all things pranks and princess! She has such a huge personality in her tiny body that it's hard to believe. All things apple for the fall season ! Isa is a 6th grade Cambridge student at Westwood. She spends almost all her down time reading or drawing in her art books. Chris & Abbie Chris is getting ready to graduate 5th grade and is preparing for middle school. He enjoys all sports, especially baseball, strength training and the occasional video game. Abbie is finishing her freshman year in high school. She is excelling in two different programs and is on the honor roll. Jaden is a student at P.K. Yonge where she plays both soccer and volleyball. Darcy is now a 6th grader at Kanapaha Middle School with a profound love of books, baking and theater. Savannah Savannah recieved her undergrad degree from UF in December of 2016. She is currently in grad school at UF and will graduate with her masters in May 2020! Brooke & Bryce Brooke loves cheerleading and musical theater. Bryce loves all things football, basketball and baseball. And, they both love the Gators!!! Lucky for us, there are helpful services such as ancestry.com and 23andMe available to us now to make the search a little easier! Ancestry.com is a website that will store your information and help you to compile an extensive family tree over time with documents, photos and connections to other people who are trying to connect the same relatives. 23andMe is a service that will tell you about your family history more in depth because it bases it off of your DNA. Once you send in a sample of saliva -- yes you have to send them your spit -- they will send you back an abundance of information about your DNA relatives. There are even versions of 23andMe that will give you medical insights about you based on your DNA. This can be helpful to create a greater understanding of what diseases and illnesses to be cautious of down the line. But for those of us who just want our children to visualize their family tree, spend a day or weekend diving right into the history of your family. A DIY family tree will help you get a start uncovering your families past. The old-school family tree is a great way to get everyone together and learn a lesson or two about your family’s history. It’s also a great way to share family memories of the past and talk about how your history has helped you family develop today. With a little bit of help from mom and dad, they’ll be experts on their family tree in no time! Preserving history in a family tree is an important practice so future generations can learn about their families and remember those who have passed away. Though we have social media now to check in on any family member we like, it’s still sometimes hard for our little ones to get a grasp on how big our families really are and remember all the people within them. for Your Perfect Family Tree: 1. Start with everyone in your home, the kids, then Mom and Dad, then slowly work your way up the tree! 2. Do some research before hand about your family so that your little ones get the most accurate description of each family member. 3. Go in depth and include things like what each person does for a living. 4. Don’t add too many sentences so it doesn’t get confusing! Print out pictures of your family members and add them on the tree. That way your child can really see the flow of their family tree! Motivating the Unmotivated Homeschool Student BY CRYSTAL LADWIG, PH.D.
Let’s be honest. We all have days when we just want to stay in bed all day. The last thing we want to do is get up, make sure everyone gets their schoolwork done, and go to co-op, music lessons and sports practices. But we do it anyway because we’re responsible adults, right? If we have unmotivated days, it should come as no surprise that our children do, too. If those days are occasional, don’t worry about it. They come and go for everyone. But if those days become chronic, it might be time to make some changes to motivate your unmotivated home-schooler. WHY AREN’T THEY MOTIVATED? One of the first things we need to do is look at our own expectations. If our children are bored or struggling every day, then they naturally become unmotivated. Examine their activities and honestly evaluate if they’re helping children learn. If not, it may be time to make changes. We also need to look at our behaviors. When parents take a hard look in the mirror, we sometimes find that we’re the ones causing our children to become unmotivated. Are we pushing them in an unhealthy way? Of course, we want to encourage children to learn and become productive members of society. But that should be done in a loving, encouraging way. Unfortunately, when we get stressed out, we may approach our children and home schooling in an unhealthy manner. Finally, we need to look at our children. There is no better motivator than one that’s internal and doesn’t depend upon anyone else. We’ve all seen children glued to video games. Why? They’re motivated to do them. They’re interested in them and enjoy them. What interests your child? How can you incorporate that into your homeschool? We used my son’s interest in video games to fuel his school. He took computer coding classes and researched careers involving cyber security. We even went on a field trip where he learned about how the military uses people like him to design, develop and refine training simulators to train pilots and plan for missions. While we don’t want to bribe our children to do their schoolwork, we do want to encourage them. Rewards are a great encouragement. They have the added bonus of allowing us to express what we value most about our children. When you see your child push through a hard subject, provide a reward. It doesn’t have to be huge. Extra freetime or a special treat will do. They key is to reward their persistence. Local homeschool mom, Corissa Jones, says her family celebrates small things, like a special treat when her son finishes a unit. One of the greatest things you can do to motivate your children is to send them outside. Physical activity works wonders for resetting the brain and helping adults and children alike to focus better. Go outside or change the venue, suggests local homeschool moms, Melanie Van Steenburgh and Staci McGovern. Math on the trampoline! Why not? In the end, it comes down to what you can do to encourage your child. Whether it’s something they enjoy, the positive feelings that come when parents acknowledge hard work, or changing the setting, encourage your children and help them discover their own motivations. Do you know a teacher who goes above and beyond for his students? An administrator who is truly devoted to making her school a better place? Giggle Magazine wants to know! Visit Gigglemagazine.com to submit your favorite educator for a chance for him or her to be featured in one of our upcoming issues. My favorite part of the day isn’t really a “part” because I cherish the tiny “A-Ha!” moments my students have throughout the day while learning new skills. Those tiny moments are what make up a really great day and I truly value the whole process of our learning together. My favorite subject was anything journalism or TV production. In middle school, I was a news anchor for the morning news and I loved dishing out the "inside scoop" on school events. In high school, my friends and I loved making short videos for class projects. The crazier, the better! How do you wind down from a long day of teaching? What was the best moment you have ever had while teaching? Checking out local nature trails with my pup, Allegra. The best moment I've ever had while teaching was the time a student came to visit me after five years (she was 10) and thanked me for believing in her. She had some unfortunate events unfold while she was in my class and everyday was like starting over for her in terms of routine, behavior and emotional support. I asked her what she remembered the most about pre-K and she said "you treated us like we mattered." That really hit me hard and I will cherish that moment forever. What do you like to do outside of the classroom? I am an improv comedian and an aspiring local actress. Share a funny teaching moment/day. One time a student overheard me tell my co-teacher that I had been sick over the previous weekend with a “stomach bug.” He looked so concerned and came over to me, rested his hand on my shoulder and said, “Well, when did it crawl out of you?” It was the cutest thing. What is your favorite part of the school day? families (and often pose for silly photos) before they head to the sink to wash their hands and start their day! Enroll them in Kumon today! • Summer is the perfect time to accelerate your child’s math and reading skills. • Many Kumon Students are studying above grade level. • For over 60 years, Kumon has benefited millions of kids around the world. VANTAGE D A IC M E D A C A E R! ©2019 Kumon North America, Inc. All rights reserved. make a $25 deposit to hold a spot. Parents may contact their child’s school for more information or call the district’s EDEP office at (352) 955-7766. “It's always a good idea for incoming students and their families to attend the roundup to see the campus, meet the staff and learn more about their school, so that they're more familiar and comfortable with it when school starts in the fall. Having more students enrolled early also helps the school with planning,” said Jackie Johnson, Public Information Officer for the Alachua County School District. If families cannot attend the Kindergarten Roundup, families may go to the school at any time during regular hours to enroll their child, even during the summer. They may also call the school to make an appointment. It's always a big milestone for parents when their child enters kindergarten. Alachua County’s Kindergarten Roundup, makes it easy for parents to enroll their children at their zoned elementary school quickly and efficiently while also allowing parents and children to get comfortable with the school, teachers and classmates. The 2019 Kindergarten Roundup will take place on May 15, 2019, at all Alachua County elementary schools. Under state law, a child must be 5 years old on or before Sept. 1st, to start kindergarten. Parents who are unsure of what school their child is zoned for, can call the zoning office at (352) 955-7700. When attending the roundup, parents should be prepared to bring their child’s certified birth certificate, proof of physical exam, immunization records, social security card and two different proofs of residence in the parent’s name. This may be a rental or lease agreement, utility bill, deed, sales agreement or property tax bill. An early diagnosis of Type 1 diabetes hit a sharp chord with Abby and her family. Only 3 years old at the time, Abby dreamed of being a singer-songwriter and did not want her hopes to fall flat. She relied on her UF Health pediatric endocrinologist and other expert caregivers to work in harmony. Together, they composed the perfect treatment medley to help her grow healthy and strong. Now she is upbeat about her future. There is a lot of planning that goes into nursery prep. It all comes down to knowing what’s best for you and your newborn baby. We’ve narrowed down your options to help you pick the best-fit baby monitor for your home! Nighttime and naptime just got a whole lot easier! Cocoon Cam Baby Monitor $129.90, Cocooncam.com HD live-stream video with night vision and two-way audio are not the only thing this monitor can do! It also tracks your baby’s breathing and movement without putting anything on your baby while he or she sleeps. Angelcare AE315 $159.99, Angelcarebaby.com This monitor goes above and beyond with an under-themattress breathing movement senor pad, setting off an alarm if there have been no breathing movements for 20 seconds. It is paired with a low-profile camera and a parent unit with clear night vision. Evoz Smart Baby UrbanHello Remi Monitor $100, Urbanhello.com $229.00, Myevoz.com This baby monitor connects This small monitor does a great with your smart phone and job at letting you know that your does everything from monitor baby is crying. You can receive audio, tell time and even text messages, emails or alerts play music. The face on the when your baby cries for whatever monitor lets your children time duration you set. The Google know when it's time to get up and Apple compatible app makes or get to bed. it easy to share all of the data with your pediatrician or sleep coach. The monitor is even compatible BabySense Video Baby Monitor One with your Apple Watch. + Two Camera Options Price Varies, Babysensellc.com Safetyfirst, as this monitor ensures a secure and private connection between you and your baby at all times. It also features two-way talk back communication and even room temperature monitoring! The two camera option is great for a family with twins or more than one baby. The wide-angle lens also provides a great view of your baby’s room! Owlet Smart Sock + Cam $399.00, Owletcare.com This baby monitor will ease your mind! The soft sock tracks your baby’s heart rate and oxygen levels, while streaming video and audio directly to your phone. Viziö Bblüv Digital Video Baby Monitor $149.99, Bbluvgroup.com With automatic night vision, ultra clear vision and two-way audio, you can’t go wrong with this baby monitor. And for the babies who love to fall asleep to music, the monitor comes equipped with eight lullabies and a nighttime function. There are also four alerts and alarms to make sure that you don’t miss a thing, from low and high temperature to a baby feeding alert, you can start each night without a worry in mind. MAMMOGRAPHY We are pleased to announce the addition of 3D mammography services to our new and existing patients! Your breast health is important to us and the convenience of in-house mammography ensures a cohesive wellness plan. Call 352-332-7222 for more information and to schedule your appointment. We are pleased to announce the addition of 3D mammography services to our new and existing patients! Your breast health is important to us and the convenience of in-house mammography ensures a cohesive wellness plan. Call 352-332-7222 for more information and to schedule your appointment. c2c | infant outlet covers or outlet plugs. These precautions will make sure they stay safe as they become more curious. As your baby also begins to stand, it is important to remember to lower their crib. When your baby begins standing in his or her crib, the risk of falling out of their crib greatly increases. Lowering the crib already gets your baby close to the floor in the case of an accident. We can all agree that the most important aspect of parenting is safety, and as your baby ages, baby proofing should be at the top of your list. According to kidshealth.org, accidental injury is the leading cause of death in kids up to the age of 14. Getting a head start on baby proofing is ideal and you should begin doing so before your baby grows. It’s important to remember that the baby proofing in your house will change as your baby begins to learn. Here are some ways to modify things around the house to make sure your baby or toddler is safe and sound as they grow and explore. Your little ones could start taking their first steps anywhere between nine and 14 months, according to Baby Center. When they are learning to walk, there is a lot of fumbling and falling involved, so you need to make way for your little cruiser. This is Florida, and many of us have pools. A pool gate is an important thing to have for your walking baby. You should never run the risk of an accident. Having long curtains that they could accidentally pull on for stability could be a hazard because at this point they are stronger and could pull down the curtains. Having shorter curtains or retractable, cordless blinds could be a better option. Cabinet locks can also be used to stop them from rummaging through bathroom and kitchen cabinets. Also, things like candles or small table decorations could be easily reached as your child walks around and explores. Make sure these items are put away and out of reach. Mom of two, Victoria Hodge, notes that taking those extra steps to make sure everything on the table is put away, hot pans are moved away from the edge of counters and nothing breakable is in the bottom of the pantry are a must. “I think the day-to-day precautions are the most important.” “Keeping your child safe is the most important job as a parent that can never be taken too lightly,” Flemming said. Taking these precautions will ease your mind as your baby grows and explores his or her home. Baby-proof your house so that all the memories that you make in the first years are sweet and safe! “The most important precaution I took when baby-proofing my house was to cover the outlets, pick up small toys that are possible choking hazards, and lock any cabinets with cleaning or poisonous products,” Flemming said. She remembers the outlet covers and cabinet locks to be two products she used the most to make momlife a little easier. Book your space and try us FREE opening week! Kids grow up so fast, perhaps a little too fast. Your tiny bundle of joy is now a rambunctious toddler who has gained the ability to mischievously jailbreak their crib, scaling the bars with wild abandon. It might be time for the next milestone in your youngster’s life - the transition to a toddler-friendly bed. Jennie Clarke, a certified sleep consultant for Good Night Sleep Site Florida, says the best way you can tell if your child is ready for the change is if they can follow a simple, set of directions and stick to them, so that when you lay out ground rules about the new bed they can better understand that they need to stay in their beds and get to sleep. “Another clue is that they’re great sleepers,” said Clarke. “You can trust in their sleep, that they sleep through the night, they nap well and also, if they ask for the new bed, because if they want to go, then your success rate of a transition is much stronger.” If you move your child when they can’t sleep through the night, this tends to make the transition more difficult. Making sure that your child is getting enough sleep during this process is crucial for their health and development. Dr. Darlene Kertes, who is an associate professor of psychology at the University of Florida, says that by age 3, children still need about 12 hours of sleep, per night. “Sleep is critical for physical growth,” said Dr. Kertes. “The hormones responsible for growing are released during sleep. Poor sleep can also have negative impacts on children’s ability to regulate their emotions.” Clarke says one of the common errors she sees parents make in this transition, is the child being moved too soon. “Something that seems to happen at around 18 months of age, is kids like to get curious and climb out of cribs, and parents feel that’s the sign that they need to be in a big kid bed, but oftentimes, that’s too early for them to understand that they need to stay in their crib and go to sleep,” said Clarke. Dr. Kertes recommends not moving your toddler simply because they are getting a brother or sister. “Newborn infants require a great deal of care and attention. Toddlers notice this,” said Dr. Kertes. “They might refuse to ‘give up’ the crib for a new baby because they see the crib as a place where they can get the parent’s continued attention. That can set the stage for a more difficult transition.” As adults, getting into bed for the night is simple routine, but for toddlers, this is a huge adjustment that can affect their emotional growth. Therefore, we must give it a lot of thought and know when making the move is right for the parent and most importantly, the child. “Emphasizing, in an emotionally positive and loving way, the child’s big kid accomplishments will help them to embrace and be proud of themselves for making this transition,” said Dr. Kertes. It’s important to make this change move as swiftly as possible for both you and your child. This, of course, isn’t going to happen overnight. Like most milestones, it’s going to take a lot of patience and support to help your child feel comfortable. “For the children, there is a feeling of loss of security, as the four walls of their crib are gone and it’s all they’ve ever known. So, it’s a big transition,” said Clarke. This is the bed that your child will be sleeping in after all, so do some research to find a sturdy, protective bed that will help your little one feel more secure. There are even some designed as race cars and elaborate princess castles, which can make this process a fun experience! * Always consult your pediatrician with any questions about when to move your little one. Safety First! Temper tantrums can be equally frustrating for parents and children. However, they are a normal part of early childhood development, and one of the first ways that children show when they’re upset. The tantrums typically affect children in their toddler years and can last into age 5. The causes of tantrums can include feeling tired, angry or uncomfortable. Young children experience these emotions, and tantrums occur due to a lack of understanding how else to handle and express their feelings. Because tantrums are a result of children being unable to calmly handle their feelings, parents can lead by example by remaining composed, showing children how to react when faced with frustration in the future. Dr. Douglas Fields, author of “Why We Snap” says if parents seem irritated or angered, the problem could potentially become more complicated. Abby Zachritz is a mother of five children, ranging in ages 4 to 11. Zachritz has changed her strategy of handling tantrums over the years, through learning what works and what doesn’t. Her treatment to tantrums has varied between children. “Children aren’t taught to throw tantrums, it’s just part of being human,” Zachritz said, “with time and experience, I’ve noticed that each kid is different. Some of my kids need time and space to express their frustration, because you can’t talk them out of it. But they may want to talk through it.” According to Fields, it is important to recognize that children can’t control their rage responses the same way that adults do. Parents trying to tell their children not to be angry are attempting to resonate with a part of the child’s brain that is not yet developed. Jessica Rudolph has two young daughters, a 3-year-old and an 11-month-old. When her oldest starts to throw a tantrum, Rudolph tries to get down on eye-level with her and talk it out. If her daughter is too flustered and upset, Rudolph will try to distract her until she is calmer and her focus shifts. When they’re hungry tired or confused by something. Give your child a nap or snack, or if he or she is frustrated, try to calm them. ATTENTION-SEEKING/DEMANDING tantrums Your child demands something from you or wants your attention when others are present. Just say no. Smile and say you love them. Let your child have their tantrum and offer to talk when they're calmer. Your child says no to everything you suggest. These are the ones that occur in public places like restaurants or stores. Unless your child is having a rage tantrum (below), place them in a room by themselves and give them a timeout. If you’re not at home, take them outside. Teach your child that they won’t get attention from you or others by misbehaving. Hold your child if they will let you. Tell them you will hold them until they can get control of themselves. Be your child’s anchor, assure them you will not lose control, even if they already have. *Tantrums may be associated with your child’s development. Consult your pediatrician to help you assess any concerns you may have with your child’s tantrums. with any new system installed in April or May 2019.
play a huge role in how we perceive things. Many times children get anxious because they aren’t sure what to expect at a doctor visit. They often imagine something much worse than what is actually going to happen. for the majority of young children is needles. “Some parents will attempt to get a child to behave by saying that they will have the doctor give them a shot if they misbehave,” Dr. Park points out. “Even when done jokingly, this can lead to negative associations.” This attitude can lead to children thinking that the doctor’s office is a scary place that you go for punishment rather than a place to go to keep you healthy. So, how can you help your child leading up to a visit? Dr. Park suggests discussing in detail what a typical doctor’s visit will include to help your child manage their expectations and their anxiety. She says that it is best to outline the entire visit, including all the steps like getting height and weight checked, possibly having to urinate in a cup and what tools the doctor uses. THEIR FEAR CAN FEED OFF THAT Next, Dr. Park says that it is very important to be honest if your child is getting a vaccine and to prepare them ahead of time. “It's important to be honest that it may hurt, but emphasize that it will be over quickly and that we need vaccines to keep us healthy,” says Dr. Park. “This helps instill trust that you are telling your child the truth about the doctor visit.” Lastly, when kids are sick, it’s natural to be nervous, but it’s important to manage your anxiety in an appropriate way. “Try not to discuss your fears in front of your child,” says Dr. Park, “as it may cause them to become even more scared that they are seriously ill.” If you have concerns or questions that might not be appropriate to ask in front of your child, ask to speak to the doctor separately. “Remember that the majority of us are parents, as well,” Dr. Park says. “Sometimes the reminder that the doctor is somebody's mom or dad can help make them seem less scary.” As one final thought, Dr. Park reminds us that it is very important to keep bringing your child to their well checkup every year even if they aren’t due for vaccines. “When our kids get older we tend to forget or think it’s not important,” says Dr. Park, “but we screen for many subtle things like hypertension, kidney disease, and diabetes, that don’t always present with symptoms.” Additionally, annual visits help establish a positive relationship with a child and create pleasant associations rather than negative ones around being sick and getting shots. Going to the doctor’s office might not be a walk in the park every time, but when it goes well, remember to give your little one some reassurance of how well they behaved and then maybe take them out for a little treat! What better way to teach your tween the value of selflessness than through serving others? Summer is a wonderful time to celebrate themself and enjoy the break from all the hard work of school, however, that isn’t solely what summer is about. Therefore, a worthwhile summer activity like volunteering at a community shelter, cleaning up a local school garden, or serving at a nursing home are just a few ways for your tween to have a positive impact on their community. This is something many tweens would enjoy doing, because it will target their specific likes and talents. Interest classes are usually given by businesses that specialize in a particular skill like painting, introduction to photography, cake decorating, pottery or learning a foreign language. This will take some detailed planning for parents but it will be well worth it once you see how much closer it brings your family. Plan it from week to week, with a different indoor or outdoor game for each day. Board games on Monday; family paint night on Tuesday; basketball competition with parents against kids on Wednesday; bake-off on Thursday; movie night on Friday; bike ride on Saturday and gardening on Sunday. “I’m bored!” These are the dreaded words that resonate throughout most households once summer season hits, and it becomes a parent’s job to fill up those long summer days with things to do. When all the video games have been played and all the food has been eaten, now what will you think of to occupy their time? Unlike smaller kids who are fairly easy to occupy and distract with simple, spur-of-the-moment activities, tweens need more focused and thoughtful activities to be involved in. Setting a schedule helps tweens to know what to expect from their summer time off. Summers off from school are a time that everyone looks forward to, especially kids. Now parents, on the other hand, see this as a time to get into mission mode for planning, and implementing a list of activities that will keep their tweens engaged during the summer beyond the television and the refrigerator. So when school is out and the summer begins, the fun can then begin for both you and your tween. With some pre-planning, goal setting and anticipated excitement, your tween’s summer can turn into a memorable one! Let’s look at five summer activity options and how you can incorporate them into your tweens summer schedule. While many parents have to work during the summer, the house can get a little crazy when the kids stay behind. Encourage your tween to pitch in and help you with the household chores. You can have them pull weeds in your garden or water the plants, do the dishes, wash the car and baby-sit their younger siblings. Summer is a great time to reorganize their rooms and clean out the old things they no longer need, like old clothes, toys or books from school! This is a great way to emphasize responsibility and get them engaged in what is going on with the family! These are the go-to options for many parents during the summer months to keep their tweens happy and occupied. Summer camps are a safe activity filled day, with a host of counselors assigned to groups of kids to monitor and engage with. There are camps for a variety of interests or activities. There are art camps, basketball camps, science camps, or engineering camps. Although having a summer jam-packed with activities is fun for your tweens and keeps them constantly busy, some quiet and boring summer days aren’t too bad either. Boredom provides a way for you to create, think or just rest. Summers are the most memorable times in a tweens life, so happy planning! For summer camp ideas, check out our Summer Camp Guide on page 59! Need help with RESPECT? Jonesville Choi Kwang Do Could Be the Answer! • Familiarize yourself with vaping, become aware of the hazards and understand and convey the risks. • Talk to your teens about the dangers and risks of vaping. Reiterate what they already know and make them aware of what they don’t. • Pay closer attention to your teen if you suspect they might be vaping. Teens are good at hiding their vapes because many of them are small and give off only a small smoke cloud. • Help your teen quit by supporting them. Encourage your teen and their friends to try and stop together. compared to other vapes, along with their popularity on social media, they have quickly become the “trendy” vape to have. In fact, JUUL Labs were under investigation by the Food and Drug Administration for targeting teens in their marketing campaigns last year. After the FDA warned of the risks associated with marketing e-cigarettes to minors and requested that JUUL send them their promotional materials for review, JUUL has since changed their tactics, featuring only real customers who have made the switch from cigarettes to vaping and who are at least 35 years old, according to an article from The Cut. Today, the use of vapes has already shown ties to long-term effects. According to the American Lung Association, vaping with flavored chemicals can lead to a condition called “popcorn lung.” Popcorn lung, or bronchiolitis obliterans, gets its name from the serious cases of popcorn factory workers breathing in large amounts of butter-flavored chemicals containing diacetyl. Diacetyl is also present in the flavored vape cartridges that seem fun and inconspicuous to tween and teen smokers. The condition causes irreversible “scarring of the tiny air sacs in the lungs resulting in the thickening and narrowing of the airways… that causes coughing, wheezing and shortness of breath, similar to the symptoms of chronic obstructive pulmonary disease (COPD),” according to the American Lung Association. So, while vaping may seem like a less dangerous alternative to smoking real cigarettes, the danger is still very present and more pressing than ever. Thankfully, Alachua County is striving to make a difference with teens and tobacco. Although youth vaping has increased by about 60 percent in the last two years, an ordinance passed in January that will prohibit the sale of tobacco products, those including e-cigarettes, to anyone who is younger than 21 years old in Alachua County. to thank you for being you. Get Connected The doors at The Rock of Gainesville are wide open to people from all backgrounds, regardless of where they are on their spiritual journey. It won’t take you long to discover that we’re more than just a Sunday church. In fact, we’re actually a network of Connect Groups. And, if you’d like to develop authentic and enduring relationships with others, you’ll be glad to know there are opportunities to join a group at any time. Stay and Play 9–11 a.m. Sun Country Sports – West Suncountrysports.com Kiddos 5 years and younger will develop basic motor skills as they participate in obstacle courses and bounce around in the Bounce Room before ending with Circle Time and a snack. Prices range from $11.50 for members to $14 for nonmembers. Repeats every Tuesday. Stay and Play 9–11 a.m. Sun Country Sports – West Suncountrysports.com Kiddos 5 years and younger will develop basic motor skills as they participate in obstacle courses and bounce around in the Bounce Room before ending with Circle Time and a snack. Prices range from $11.50 for members to $14 for non-members. Repeats every Tuesday and Friday. Whether you are 2 or a 102, we look forward to creating and maintaining a beautiful and healthy smile. Tour the Harn with your little ones with this program designed for children ages 2–5. Space is limited, so arrive 15 minutes early to register. Tour the Harn with your kids and discover some of the materials and processes behind the beautiful art! After the tour, you will learn about screen-printing as you create a print of your own. The event is ideal for children ages 5 – 11, but all ages are welcome. Swimmers of all skill levels can join in for 30 minutes of mixed group instructional time, followed by 30 minutes of open swim time. Prices range from $16.50 for members to $20 for non-members. This event repeats every Sunday. Frogs and Friends Friday 2 p.m. Cityofgainesville.org Education Building at Morningside Nature Center Little ones are welcome to join Morningside Nature Center animal caretakers as they feed the amphibians and reptiles. Splash Jam 11:10–11:30 a.m. Sun Country Sports – West Suncountrysports.com Swimmers of all skill levels can join in for 30 minutes of mixed group instructional time, followed by 30 minutes of open swim time. Prices range from $16.50 for members to $20 for non-members. This event repeats every Saturday. Living History Day 9 a.m.-4:30 p.m. Morningside Nature Center Cityofgainesville.org Join the Morningside Nature Center as interpreters portray day-to-day life on an 1870 Florida farm. Experience the agriculture and history that Florida was built on, for free! Apex Martial Arts offers this free Afro-Brazilian martial arts class for all ages. Event repeats every Saturday. This parent-toddler program will help your little one explore music and dance through props, costumes and fun-filled activities. Admission ranges from $10 for members to $12 for non-members. Event repeats every Thursday. Browse over 150 species of difficult-to-find and pollinator-friendly plants to add to your garden at this sale. Proceeds benefit the Butterfly Rainforest. 60th Spring Parade of Homes Noon – 5 p.m. Bancf.com Tour homes in Alachua County built with the most up-to-date energy saving techniques and designed according to the latest trends. Explore Northeast Gainesville’s historic district while admiring artist’s booths and listening to live music. Admission is free! UF Health Shands Childbirth Education Class 9 a.m.–3:30 p.m. UF Health Shands Hospital Room 2147 Ufhealth.org This expansive course covers the birthing process, pain management options, and postpartum care. It includes a tour of the labor and delivery and mother/baby units. The class costs $50. Visit gigglemagazine.com for more information! Harn Museum Nights: Love, Africa 6–9 p.m. The Harn Museum Harn.ufl.edu Enjoy art from throughout Africa and the African diaspora, West African dance and music, and refreshments, all for free. Museum for Me Autism Event 10 a.m.–1 p.m. Florida Museum of Natural History Floridamuseum.ufl.edu Adults and children on the autism spectrum are encouraged to explore the museum on this day without the concern of crowds. There will be a quiet space in the Discovery Room for those who need to desensitize and sensory maps. UF Health Shands Newborn Care Class 7–9:30 p.m. UF Health Shands Room 2147 Ufhealth.org This class is designed to help new parents learn to care for their newborn and covers topics such as diapering, soothing and infant safety. The class is $15 to attend. Tour homes in Alachua County built with the most up-to-date energy saving techniques and designed according to the latest trends. Ninja Jam 9:30–10:45 a.m. Sun Country Sports – West Suncountrysports.com Designed for boys and girls between the ages of 3 and 13, this class includes 30 minutes of mixed group instruction and 45 minutes of open ninja time. Prices range from $16.50 for members to $20 for non-members. Friends of the Library Spring Sale Saturday: 9 a.m. –6 p.m. Sunday – Wednesday: Noon–6 p.m. 430-B N. Main Street, Gainesville, Florida 32601 Folacld.org From children’s books to comic books and music to movies, bring your family out to the Spring Friends of the Library Spring Sale to find great items and great prices. The museum is hosting a demonstration day for the VR for the Social Good class to promote the research and development of virtual and augmented reality applications. The class will share more than 15 demonstrations. Take your family out for a guided tour of Kanapaha Botanical Gardens’ 24 major collections. This tour is $8 for adults, $4 for children (5-13) and free for children under 5 as well as members. The North Central Florida YMCA is hosting community event. The event is to inspire kids to be active and improve health and well being for kids and families. It will feature games, healthy cooking demonstrations, arts and crafts and more. Tot Trot Nature Walks 12:30–2 p.m. Florida Museum of Natural History Floridamuseum.ufl.edu Get your toddler excited about exploring the outdoors with a safe and hands-on nature walk. The indoor-outdoor experience will explore the “Discovery Zone” exhibit and the UF Natural Area Teaching Lab. The event is $8 per nonmember child/adult pair and $6 for each member pair. Spring Music Series, Richy Santo 3 p.m. Meeting Room A Headquarters Branch This free performance is part of the Spring Music Series. Richy Santo is the Santa Fe College guitar professor and has composed TV commercials for Target, AT&T and more! He has also toured with Bo Diddley, Toby Keith and Trisha Yearwood. 5th Annual Garden Show & Spring Festival 9:30 a.m.–5 p.m. Cedar Lakes Woods & Gardens Cedarlakeswoodsandgarden.com Admission for this two-day festival is $9 for adults and $4 for children between the ages of 6 and 13. Little ones are welcome to join Morningside Nature Center animal caretakers as they feed the amphibians and reptiles. Leadercast: Lead Yourself 8:30 a.m.–5 p.m. Queen of Peace Academy Advantagemediapromotions.com Hear from speakers like Gayle King and Juliet Funt at this leadership conference. Tickets are $130 and $75 for students. 9 a.m.–3:30 p.m. UF Health Shands Hospital Room 2147 Ufhealth.org This expansive course covers the birthing process, pain management options, and postpartum care. It includes a tour of the labor and delivery and mother/baby units. The class costs $50. Designed for boys and girls between the ages of 3 and 13, this class includes 30 minutes of mixed group instruction and 45 minutes of open ninja time. Prices range from $16.50 for members to $20 for non-members. 2–4 p.m. James Paul Park Highspringsmusicinthepark.com This concert is free and open to the public, but seating is limited. New Crocodile Exhibit opens at the Florida Museum! Kristin Chenoweth is best known for her Broadway role in “Wicked,” and her various onscreen roles as well. This night will be all about Kristin, singing songs and telling her experiences about her life on stage and on the big screen. The annual Kindergarten Round Up to register your child for the upcoming school year. Cost is $25. Florida Museum Free Admission for Veterans Florida Museum of Natural History Floridamuseum.ufl.edu Veterans can enjoy free admission to the “Butterfly Rainforest” and “CROCS” exhibit, with valid form of identification! 10th Anniversary Issue, Mother's Day, Baby Issue, Summer Camps and more!